In vitro nucleic acid amplification test for the quantitation of BCR-ABL1 and ABL1 transcripts in total RNA from whole blood of diagnosed t(9;22) positive Chronic Myeloid Leukemia (CML) patients expressing BCR-ABL1 fusion transcripts type e13a2 and/or e14a2. The QuantideX qPCR BCR-ABL IS Kit is a reverse transcription-quantitative PCR performed on the Applied Biosystems 7500 Fast Dx Real-Time PCR Instrument and is intended to measure BCR-ABL1 to ABL1, expressed as a log molecular reduction (MR value) from a baseline of 100% on the International Scale, in t(9;22) positive CML patients during monitoring of treatment with Tyrosine Kinase Inhibitors (TKIs). The test does not differentiate between e13a2 or e14a2 fusion transcripts and does not monitor other rare fusion transcripts resulting from t(9;22). This test is not intended for the diagnosis of CML. 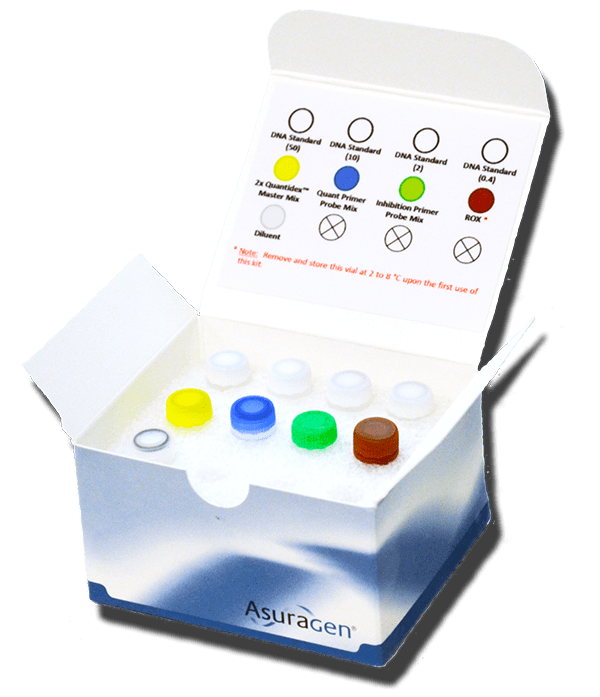 DESCRIPTION: Kit uses blood specimens from patients with CML to measure the amount of BCR-ABL, which can be used to estimate the amount of leukemia cells in a patient when treated with BCR-ABL targeted therapies.